Inspired by the recent remix pack celebrating the 25th anniversary of “Treaty (Filthy Lucre Remix)”, ARIA Hall of Fame inductees Yothu Yindi reunite with Gavin Campbell, founding member of Filthy Lucre in a reinvigorated formation. Featuring original Yothu Yindi members and special guests performing the band’s classic hits as well as brand new material, all with an electronic twist, in a cross-generational celebration of cultural diversity. Founding members Witiyana Marika, Stuart Kellaway and Kevin Marlangay are joined onstage by former bandmates Ben Hakalitz and Shellie Morris and popular Indigenous singer/songwriters Yirrmal, Dhapanbal Yunupingu, Kamahi Djordon King and Yirrnga Yunupingu. 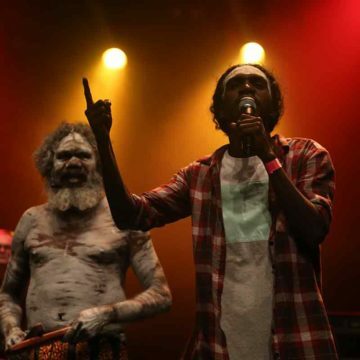 First Nations vocalists, Yolngu man Yirrmal, who is the son of Witiyana, along with Dhapanbal, the daughter of the late Yothu Yindi frontman, Dr M. Yunupingu are joined by celebrated Indigenous artist and performer Kamahi Djordon King, exciting new vocalist Yirrnga Yunupingu and yidaki player Yimila Gurruwiwi. Our very special guests onstage are multi-instrumentalist Ania Reynolds, the current musical director of Circus Oz, guitarist Roy Kellaway (son of bassist Stu) and triggering the Toraiz SP-16 and percussion, DJ/producer Gavin Campbell. Yothu Yindi released their timeless hit ‘Treaty’ in 1991 as a protest against a broken promise by the Hawke Government. Clearly, the time is now for the band to hit the road again, raising awareness for the need for treaty with Australia’s First Nations People.